He or she is always an extraordinary individual whose incredible life serves as the brilliant inspiration to many. Dr. APJ Kalam was surely one such grand human being whose achievements, humility, sincerity, hard work, positivity and never-give-up outlook had and would always impart a great moral fillip for all, at every stage of life. One of the most important characteristics of an ideal role model is never to give up hope and hard work in the face of oddities. Life is ready to throw challenges at different stages but a true winner is the one who does not get vulnerable to the unfavorable situation and keeps on finding ways to beat the challenge and fight right up to success. 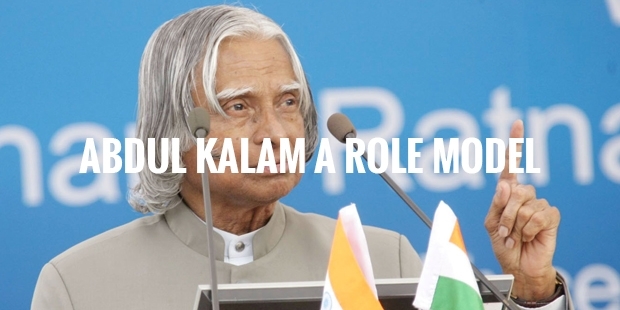 Dr. Kalam had been one such gallant fighter since his childhood and its bravery to face challenges with a smile right as a kid that has duly elevated to the cult status of a role model for all. The much revered ISRO project direct and former head of India hailed from a poor family in Rameshwaram. His father was a boat owner of modest means and found it hard to run the family alone. Dr. Kalam had this dream to make it big one day since his childhood and despite his underprivileged situation. Thus, when he saw that it was getting hard for his father to make both ends meet, he took to selling newspapers, along with continuing his education. It was his utmost dedication to his studies; in spite the different oddities in his surroundings that earned him the scholarship to study his desired aerospace engineering from Madras Institute of Technology. “End is not the end, if fact END means "Effort Never Dies" - If you get No as an answer, remember NO means "Next Opportunity". So Let's be positive." The poor boat-owner’s son, who used to sell newspapers to help out his dad as a lad, went on to become a scientist at DRDO and later the honorary project director of ISRO, under whom India’s first ever SLV-III deployed the famous Rohini satellite back in 1980. In 2002, the great man was elected as the 11th President of India and he has also been a revered recipient of all the highest civilian awards of the country. He was felicitated with Bharat Ratna, Padma Bibhushan and Padma Bhushan added to several other prestigious honors from esteemed bodies all across the country and the world. Throughout his life, this great man has taught to keep on with the endeavors to fulfill the dreams the big goals in life. He always encouraged never to get bogged down by failures but to continue looking for the opportunities that will ultimately lead to the ray of light. “If you fail, never give up because FAIL means "First Attempt In Learning". Dr. Kalam became a role model not only through his fight and success against adversity but also with his humble way of living. He had always been pro-active in getting down from the podium and interacting directly with the people below, mostly kids and students. Always a believer of simplicity, he stayed unfazed by the luxuries around. Even during his stay at the Rashtrapati Bhavan, he used a small simple room and often had food with his bunch of staff, right on the floor. The great man’s ever-active lifestyle and youthful spirit was another major reason that made him a role model for all. Even after crossing 80, he did not stop playing his veena or composing poems or professing speeches before students. In fact, moments before his fatal cardiac attack of July 27th, the 84-year-old scientist was giving his lectures at IIM Shillong. Death is unavoidable but it’s Dr. Kalam’s exemplary lessons and teachings that would keep him alive in billions of hearts forever.